Alaska’s own Governor Sarah Palin spoke out Wednesday in opposition to the Clean Water Initiative #4… Palin cannot advocate for or against a ballot measure, officially, but she took what she calls “personal privilege” to discuss Ballot Measure 4.”Let me take my governor’s hat off just for a minute here and tell you, personally, Prop 4, I vote no on that. I have all the confidence in the world that the Department of Environmental Conservation and our Department of Natural Resources have great, very stringent regulations and policies already in place. We’re going to make sure that mines operate only safely, and soundly,” said Palin. In addition to Palin’s remarks, the State of Alaska has created a website “explaining” what prop #4 entails. It is clear from browsing the site where the state’s position is on the Clean Water measure (against). Alaskans for Clean Water has filed a complaint against DNR for the recently-launched state website meant to clarify the issue for voters. The group believes the state is illegally staking its position on the proposition before Alaskans vote next Tuesday. 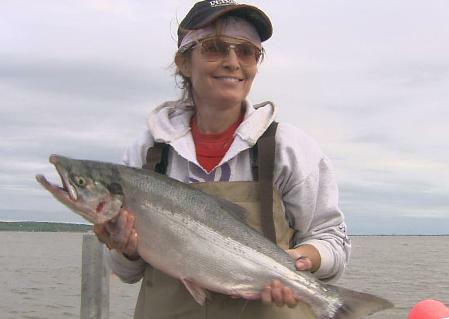 A spokesman for the group called Palin’s comments “highly unethical.” The former Bristol Bay commercial fisher Palin has fallen as quickly as she has ascended. She was elected on her ‘transparency in government’ pledge. (google: “Frank Bailey” “Sarah Palin” “abuse of power” for more details). In addition to Palin’s remarks what is MOST troubling is that the figures and charts on the state website are THE SAME data provided by the mining industry. How can we trust DNR to protect clean water when the mining industry is supplying the data to the state? Who can we trust? It is up to Alaskans to protect our water for the future. Vote YES on the Clean Water Initiative Prop #4 on Tuesday, August 26th. As of 8/21/08 APOC (Alaska Public Offices Commission) ruled that the state website http://www.dnr.state.ak.us/opmp/mini…nitiatives.htm must be taken off line. APOC also said that no state official should criticize Measure 4 publicly. Also, APOC contested DNR’s claim on the Web site that Measure 4 would apply to existing mines. How sad is it that the site had many thousands of hits. The damage is done and who knows what the ramifications will be. Alaska is truly in a sad state of affairs. Corruption is rampant, mining companies seem to have a heavy hand in the governor’s administration, in DNR, and on and on… I apologize for my ramblings but are we that blinded by $ signs? Alaskans cannot afford to put blind faith in our governor, in her DNR and the British and Canadian mining companies that can almost taste Pebble. Vote YES on #4.